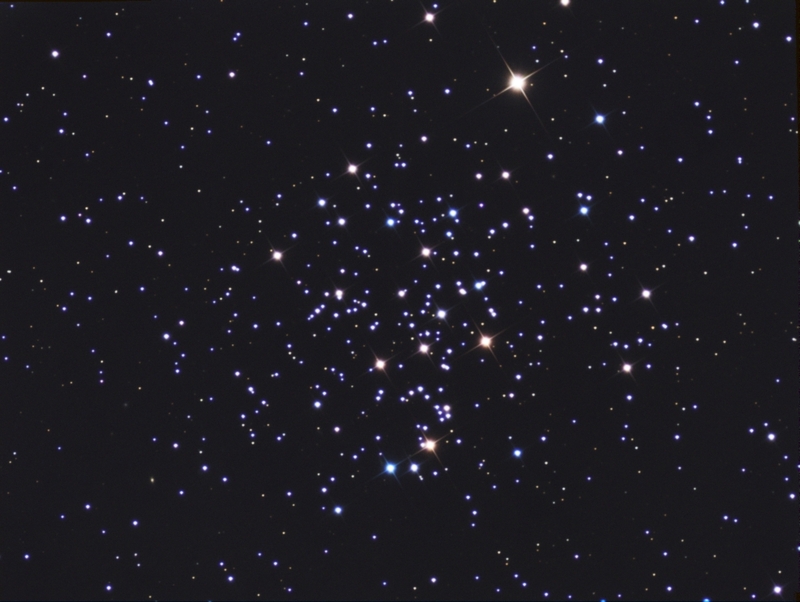 Messier 67 (M67, NGC 2682) is an open star cluster in the constellation Cancer and is about 2700 light years away. It is one of the older open clusters known and is estimated to contain well over 500 stars. Old clusters have mostly yellow and red stars since the hot, short-lived blue stars have gone supernova relatively early. Still, there are a number of blue 'stragglers' as they are called visible in the cluster. Were these stragglers captured from another cluster? Their origins are not understood at the present time. Exposure: RGB: R:23x5 min, G:22x3 min, B:18x5 min for a total of 4.5 hrs.